Curing cancer, lighting up tablets, or building handguns are three proven methods of doubling stock prices in 2015. What does Smith & Wesson (NASDAQ:AOBC) have in common with Universal Display (NASDAQ:OLED) and Exelixis (NASDAQ:EXEL)? On the surface, not much. One makes guns and handcuffs, another develops the technologies you see lighting up smartphone screens nowadays, and the third is trying to find a cure for cancer. Okay, the headline is a dead giveaway. 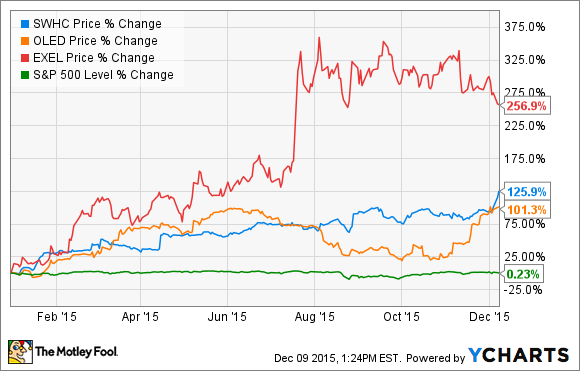 All three of these stocks have at least doubled in 2015. They took very different paths to these massive gains, however. Universal Display has several growth engines at its back. For one, the smartphone and tablet market is embracing OLED screens wholeheartedly. Recent reports show that even Apple (NASDAQ:AAPL) is ready to take the OLED plunge, just a couple of years after CEO Tim Cook calling the OLED technology inferior to his preferred Retina LCD screens. Beyond that, there will be big-screen OLED television sets, lighting panels, flexible mobile displays, and much much. But for now, Universal Display shares are surging on the Apple connection. Biotech Exelixis surged nearly 50% higher in a single day when its flagship cancer treatment candidate Cometriq met the primary goals of its Phase III FDA study. Signs of this outcome had already been piling up for months. The FDA approved Cometric for treatment of a rare thyroid cancer way back in 2012, but the same drug is now on track toward approval for a much more common form of prostate cancer. Other trials are testing its efficacy against brain, breast, lung, kidney, and ovarian cancers. Exelixis has tripled in 2015 because Cometriq is starting to look like a future billion-dollar home run. S&W sells a lot of these Model 639 stub-nose .44 magnums these days. Photo: Smith & Wesson. Meanwhile, Smith & Wesson shares surge every time there's a mass shooting, sparking calls for gun control -- which only seem to motivate people building firearm stockpiles while they still can. The gun buyers are worried about politicians taking away their second-amendment rights under pressure from the public, and respond by driving Smith & Wesson's sales sky-high. Right or wrong, it's certainly good business for the gunmaker. And those shootings just keep coming, providing ample rocket fuel for S&W shares. Smith & Wesson is the sin stock in this roundup. Exelixis is trying to cure cancer, and Universal Display wants to make your digital world a little bit prettier. All three business models have worked wonders in 2015. In a longer perspective, S&W has absolutely crushed Exelixis and Universal Display during the last five years. Like it or not, gun violence is an investable growth driver for this stock. Personally, I sleep better at night knowing that my retirement fund is growing when TV screens use less power, or theme parks draw larger crowds. But if none of this bothers you, Smith & Wesson could be a stock for the ages.